Fashioned in traditional-style, the Shambala 3 Piece Sectional is a great addition to any home decor style. Plush seat and back cushions and an abundance of pillows make this sectional the perfect spot to curl up and relax in total comfort. Comment: Includes: Left Arm Facing Sofa (71"L x 42"W x 38"H), Corner Wedge (42"L x 42"W x 38"H) and Right Arm Facing Sofa (71"L x 42"W x 38"H). Price may vary based on option(s) selected. Love my new furniture and great customer service! Love the couch, very happy with my purchase! Completely satisfied with this purchase. We love this couch! 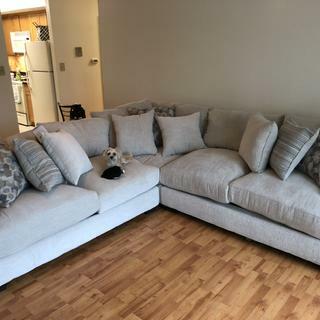 Is this sectional also available in dark grey as pictured? The American Furniture Shambala is not available in special order options the set is available in the as shown andes snow and also a fabric called shambala cream. The Shambala 3 Piece Sectional is light tan, the second image shown is to show the product in a room and is not in the correct fabric color. I have only a 29" door opening....would this sectional fit through because there are three pieces? We highly recommend to schedule a pre-measure with Jordan's Furniture to obtain the correct dimensions of what size sofa will fit in your living space. The delivery team will determine this by door size and also walls and angels. Please contact any of our locations to schedule a pre-measure.